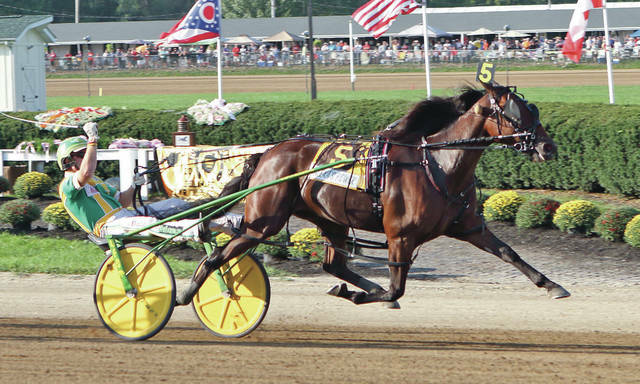 Alexa’s Power powered home to take the $230,700 Jugette for three-year-old pacing fillies Wednesday afternoon at the Delaware County Fair. When starter Mike Woebkenbuerg sent the field of eight on their way, Youaremycandygirl (Yannick Gingras) left from post 3 but broke stride and the complexion of the race changed. Strong Opinion (Chris Page) protected the rail position and Alexa’s Power found a spot at the rail through the fractions of :26 4/5, :55 2/5 and 1:22 4/5. Tetrick eased the eventual winner off the rail before the 3/4 mile pole and stuck a nose in front as they turned for home. Alexa’s Power closed the line a length ahead of E Dee’s Well Said (Jim Pantaleano) in 1:51 2/5. Strong Opinion held on for third and Aldine Hanover (Marcus Miller) was fourth. Jim Campbell trains the Somebeachsomewhere filly for Jeffrey and Michael Snyder. The Jugette win was Tetrick’s second and Campbell’s first. “This is my first Jugette and (I’m) just so excited. We have had a really good year with Alexa,” said Campbell. Ohio bred Looking For Zelda (Matt Kakaley) capitalized on a break in stride by the leader Bella Glos (Yannick Gingras) and won the three-year-old filly trot over Kenziesky Hanover (David Miller). Bella Glos led the field past the first three quarters of the mile, but made a costly break in the final turn. Looking For Zelda, who was sitting second, inherited the lead and held off a closing Kenziesky Hanover in 1:54 4/5. The Break The Bank K lass is conditioned by Norm Parker for Robert J. Key. Looking For Zelda is nearing $400,000 in career earnings after she won for the twelfth time in 22 career starts. Dragonfly (Aaron Merriman) and Pretty And Fast (Yannick Gingras) battled through the lane, but Dragonfly stuck a nose in front in the shadow of the wire to score a mild upset in the $39,318 Standardbred pace in 1:55 1/5. The Dragon Again lass is co-owned by trainer Chris McGuire, Brian Carsey and John McGill. Dragonfly paid $16.40 to win. Nomo Volo made easy work of the compact field of five in the $40,918 Standardbred Trot for freshman females. Driver Yannick Gingras sent the daughter of Explosive Matter for the early lead and went gate-to-wire in a lifetime best 1:56 4/5. Summit City Swan (Ronnie Wrenn, Jr.) and Keystone Abbey (Aaron Merriman) were second and third. Jeff Edwards trains for D. L. Dennis, F. A. Wilson and Dolne FM Services. See Me Sparkle (Jim Pantaleano) and Only Take Cash (Aaron Merriman) battled down the backstretch, but See Me Sparkle made a break in stride and Only Take Cash cruised to a 1 3/4 length win over a pair of Chris Beaver trainees, Stone In Love (Chris Page) and Pure Country (David Miller) in 1:56 2/5. The Cash Hall filly is owned by the Robert McIntosh Stables, Dave A. Boyle and Mardon Stables and trained by the Hall of Famer Bob McIntosh. The first division went to Vivi D (Kyle Ater) in a stakes record 1:56 1/5. The Broadway Hall filly is owned by Kirk Nichols and trainer Dan Ater. Bella’s Rose Power (Aaron Merriman) was 2 1/4 lengths behind the winner and Aunt Rose (Ronnie Wrenn, Jr.) finished third another two lengths behind. Mission Accepted returned to his winning ways in the first division when he defeated Pass The Vape (Dereck Watiker) and Dontforgetmaster (Josh Sutton) in a stakes record 1:54 2/5. The Manofmanymissions colt started the season four-for-four, but was held winless in his last five until today’s score. With the win, Mission Accepted has pushed his career earnings to $314,524 for Knox Services Inc., trainer Jeff Cox and David Wills. In the second $53,100 division, Aaron Merriman piloted Rising MVP to a gate-to-wire win in 1:54 4/5. MVP Luke (Dan Noble) was second and Sand Cash (Chris Page) was third. Susan Daugherty owns the My MVP gelding who won his 15th in thirty career starts. Party At The Banks (Chris Page) got up in the final strides to collar the pacesetting A Tc Queenie (Dan Noble) to take the first division. The final time of 1:53 4/5 established a new stakes record. The old record was established by A Tc Queenie last season. Party At The Banks, a Break The Bank K mare, is owned by Burke Racing Stable and Weaver Bruscemi. In the second $7,500 division, Jailhouse Sam and driver/trainer Hugh Beatty, Jr. took the lead from Full Surge (Tim Tetrick) in the final turn and cruised home in 1:54. Rose Run Sydney (David Miller) was second and The Next Triumph (Yannick Gingras) was third. The four-year old Victory Sam gelding is owned by Casey Clemens of Malta, Ohio. Today’s 22 race Jug Day Card will begin at 11 a.m.